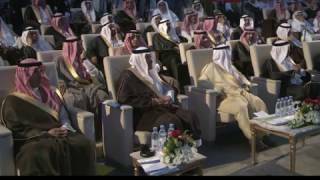 The events of STTIM-2014 in its seventh session titled: "Tourism for Sustainable Economic Development", started with a huge opening ceremony in the Riyadh International Convention and Exhibition Centre, on 29 Jumada I 1435H / March 30 - April 4, 2014). After a short documentary film about the development of the tourism sector and the achievements made by the Forum at previous sessions, the Minister of Labor, Eng. Adel bin Mohammed Faqih delivered a speech where he noted the growing success the event year after year. He pointed out that the Forum is the most prominent tourism industry event in the Kingdom. He termed it as one of the distinctive forums and exhibitions hosted by capital in the presence of experts and investors in the travel and tourism sectors. After that, Prince Sultan bin Salman bin Abdulaziz, President of SCTA, delivered a speech in which he stressed that the recent decisions of the State to support tourism and national heritage is the culmination of the cumulative work of the organization over the years. He points out that SCTA has demonstrated its readiness in tourism management and development, and has moved from the planning stage to the project implementation stage. Prince Sultan added that SCTA is working as directed by the custodian of the Two Holy Mosque to launch projects, cooperate and achieve results. He said there are pending resolutions to expand these results. HRH noted that SCTA’s focus, as directed by the State, is the Saudi citizen as the ultimate target of tourism, and that includes families and the youth. HRH said that Saudization of national tourism cannot be achieved without the State’s stimulating investments as with the other successful industries and sectors, to provide infrastructure to reach the tourism sites. In conclusion, he said that SCTA had organized a large system of service sectors, almost from the scratch. Some of them are completely reorganized, such as the visitor sectors, the travel and tourism sector, tourism service providers and the funding sectors. “And hence, SCTA is working in solidarity with a number of government agencies represented on the Board of Directors and outside of the Board, mainly the General Investment Authority, and we hope God willing to achieve additional results in the next phase,” the SCTA President added. After honoring the sponsors, the accompanied exhibition of Saudi Tourism Travel and Investment Market (STTIM-2014) was opened. The exhibition would receive daily visitors at the Riyadh International Exhibition and Conferences Centre (RICEC) from 4:00 pm – 10:00 pm.